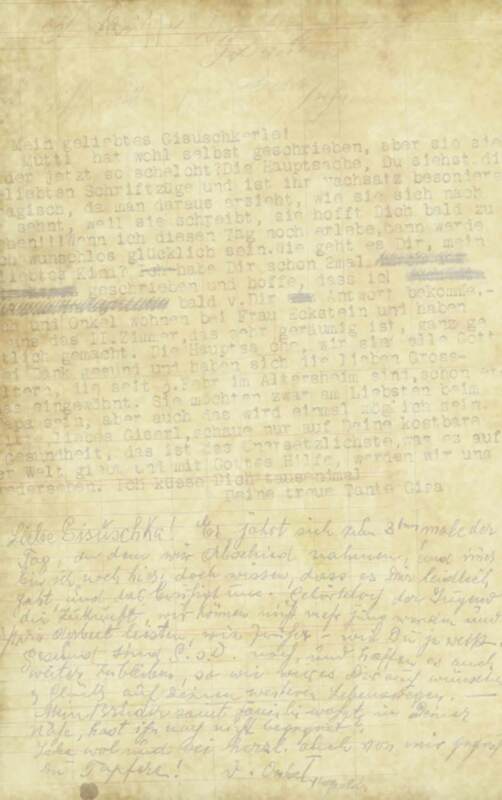 The letters and documents on this website reveal much of what my relatives in the Jellinek family thought, felt and suffered in reaction to early Nazi policies and actions. The letters, especially, also tell us about the family’s hopes and struggles to escape the Third Reich and their anguish of being left behind in it. The words are intimate and immediate, speaking of coping, optimism for the future, strong spirit and faith. Yet they also reveal deep disappointment and confusion at a world turned upside down, without the law and rational order into which the family had been acculturated. The personal voices of individual human beings before they were silenced by the Nazis are the only voices that the world can ever ‘hear’ directly from these family members/victims of the Shoah. Getting to know these relatives as unique persons, reading the eloquent expression of their thoughts, courageous actions, hopes and great distress has impelled me to construct this website. My goal is to disseminate this powerful evidence of Nazi persecution and murder as widely as possible. As you become acquainted with my parents, grandparents, aunts, uncles and first cousins, I hope that you will feel and think again about the total insanity and horrific evil that was so tragically perpetrated on these people and on millions of other human beings. About three-quarters of the letters written by the central Jellinek family members were addressed to Gisella Nadja, their daughter, niece, sister, granddaughter or stepdaughter, who escaped to British Mandate Palestine in June 1938. Almost all of the remaining letters were written to a sibling, parent, son or cousin. All of the Shoah period letters, up to the last one I have from June 1941, continue to show the very close, loving, caring and strongly supportive relationships in this family. The length and frequency of the letters (there were many more letters that were lost), as well as the dedication to passing each letter around to multiple family members, also provides evidence of the family’s closeness. The imprisoned family members must have suffered terrible additional anguish and heartbreak when they couldn’t even write or receive letters anymore. Several significant post-war letters add to our knowledge about where the members of the family were from 1938 - 1942, where some of them were murdered, and where others found refuge. From their center in the small town of Oberhollabrunn, northwest of Vienna, the family was dispersed to at least 11 cities on four continents. The letters, documents and photos also reveal much about a part of the Austrian Jewish culture and community in which this family had lived and flourished pre-1938. I launched this site in 2013 with a selection of poignant letters, primary documents and photographs, as well as paintings/collages. More letters, documents and images have been posted since then and will continue to be gradually added in the future. Please check back. I am also grateful to historians and Professors David Engel and Bernard Wasserstein for their interest in the letters and their evaluation of them as important epistolary evidence. Finally, I would like to thank and dedicate this website to my dear family members who each contributed in his/her unique and very important way: my parents, Karl Jellinek and Kreindel/Karla/Caroline E. Jellinek; my husband, Sid Perloe; my sisters, Michaela J. Vilhotti and Roberta Jellinek-Mansson; my daughter, Alexandra H. J. Perloe; my son, Gabriel S. J. Perloe; and my first cousin, Gisella Nadja Jellinek Gal. Gisella Nadja’s sharing of her loving, vivid memories contributed immeasurably to my gaining painful understanding of and uplifting respect for my Jellinek relatives whom I could never meet.